"We and the Father Are One"
When we invoke The Great Invocation, there is an important symbolic significance of the points of contact we are making in the way we connect with this great being. In regard to the Planetary Logos, the centers referred to in the Invocation could be said to be chakras. When Sanat Kumara hooks up in meditation with the Solar Logos, Shamballa ~ or the Will of God ~ is their point of union. We are asked to connect there with Them, and in this way to embrace the Plan of Love and Light, for as humanity we belong to the throat chakra of this great being, our Planetary Logos. Here is the Head Center, the directing center for the Hierarchy, Shamballa. 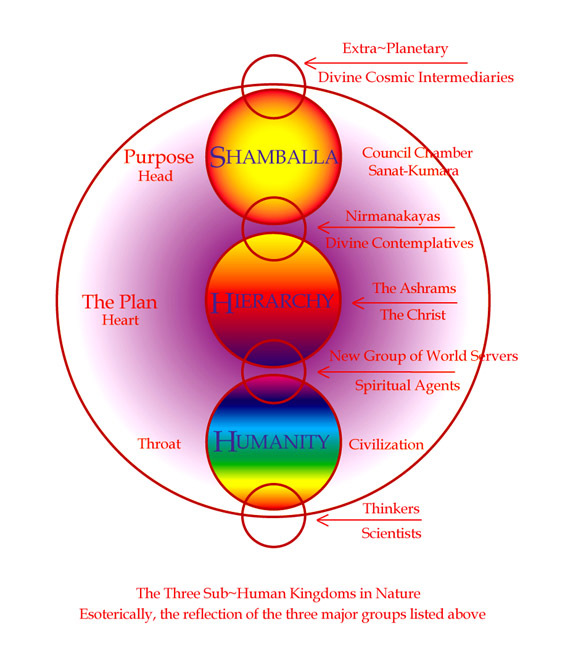 As it constitutes the synthesis of understanding insofar as our Earth is concerned, Shamballa is also the center where the highest Will of the Solar Logos is imposed upon the Will of our Planetary Logos, Who is part of a center in the Solar Logos's greater body of manifestation.